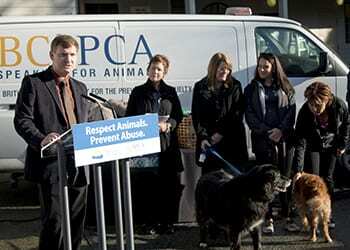 On Feb. 22, BC SPCA chief executive officer Craig Daniell stood proudly with B.C. Premier Christy Clark and MLA Jane Thornthwaite to announce an upcoming major change in B.C. animal welfare legislation. The B.C. government will adopt a regulation under the Prevention of Cruelty to Animals Act recognizing the Canadian Veterinary Medical Association’s Codes of Practice for both kennel (PDF) and cattery (PDF) operations as generally accepted management practices for cat and dog breeders in British Columbia. The codes set clear expectations for breeders to respect the practices considered acceptable by government. The premier also gave details about a consultation process that will continue through 2016 to develop new laws that will assist the SPCA in monitoring and taking action against irresponsible breeders of dogs and cats. “Legislation is going to require that there be licensing for every cat and dog breeding facility in the province,” Premier Christy Clark told the media, “with licensing comes inspection and with inspection comes being held to high standards”. This is a welcome announcement for animal lovers in British Columbia that have recently seen two high profile seizure cases from breeding facilities in the lower mainland where animals were kept in deplorable conditions. These seizures resulted in more than 140 cats and dogs coming into the care of the BC SPCA. MLA for North Vancouver-Seymour, Jane Thornthwaite, who introduced a private members bill in 2012 to regulate the dog breeding industry, was there to celebrate the announcement, reminding us that “British Columbians deserve the certainty that companion animals sold in our province are born and raised in a secure, caring environment.” Often, unwitting British Columbians end up supporting puppy and kitten mills because there is no provincial certification process and they don’t know what questions to ask the breeder. The BC SPCA has been advising the provincial government since last year on a system for licensing dog and cat breeders, and hopes that new regulations and legislation will prevent the type of animal suffering caused by large scale, unscrupulous commercial breeding operations.